Program launched on National Hydrogen and Fuel Cell Day gives policy-makers, public opportunity to explore benefits of transformative technology. CANTON, OHIO, UNITED STATES, October 8, 2018 /EINPresswire.com/ — Kirt Conrad, CEO of the Stark Area Regional Transit Authority (SARTA), believes hydrogen fuel cells (HFC) are the future of automotive, commercial, and public transportation. In fact, he believes it so much he’s willing to lend any transit agency in the country one of SARTA’s hydrogen fuel cell-powered buses for free. All an agency has to do to is call and ask. The Central Midlands Transit Authority in Columbia, South Carolina will be the first agency to borrow a bus. Canton, Ohio-based SARTA provides a compelling chapter in the fuel cell story. The relatively small public transit agency will soon have one the largest fleets of hydrogen fuel cell-powered buses in the U.S. outside of California and one the largest in the world. 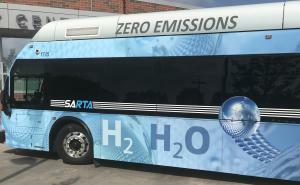 SARTA used a combination of state and federal grants to acquire 13 buses and build a hydrogen refueling station.